1. Social media accounts for only 16% of customer engagement today, but is expected to increase to 57%—the second-most used channel, behind only face to face interaction—within five years. (Marketing Pilgrim). 3. Brazilians have the highest number of online friends of any country, averaging 481 friends per user, while the Japanese average only 29 friends. (MindJumpers). 4. 56% of Americans have a profile on at least one social networking site. And it’s not just millenials; 55% of those aged 45-54 have at least one social network profile. (Convince & Convert). 5. 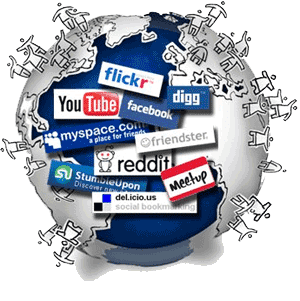 Social networks and blogs In the U.S reach nearly 80% of active U.S. Internet users and represent the majority of Americans’ time online. (MediaPost). 7. 90% of marketers now use social networks in their marketing efforts, but growth has plateaued; the figure was 89% in 2011. (eMarketer). 8. Half of all social media users are between 25 and 44 years old, but the age distribution varies widely across social networks. Reddit and Tumblr are among the “youngest” networks, with half or more of users under 35 years old. Twitter is about in the middle (55% of users age 35 or older) while 65% of Facebook users are over 35 (didn’t this start with college students?) and LinkedIn is the “oldest” network, with 79% of users age 35 and older. (Pingdom). 10. 10. Social media and blogs reach 80% of all U.S. Internet users. 91% of experienced social marketers see improved website traffic due to social media and 79% are generating more quality leads. (Business2Community). 11. 11. 90% of companies with 100 or more employees use social media in their marketing mix. 83% use Facebook and 53% are on Twitter, though that gap is expected to narrow by 2014 due to rapid growth in Twitter use. (eMarketer). 12. 12. Just 23% of Fortune 500 companies maintain an active blog, vs. 37% of Inc. 500 firms. (V3 Integrated Marketing). 13. 35% of the top 100 Fortune 500 companies have a corporate blog compared to 14 percent of those Fortune 500 companies in the bottom 300-500 of the category, i.e., top companies devote more attention to their corporate blogs than those in the bottom of the pack. (V3 Integrated Marketing). 14. 62% of Fortune 500 companies have an active Twitter account, while 58% maintain a corporate Facebook page. (V3 Integrated Marketing). 15. Looking at five leading social networks (Twitter, Facebook, YouTube, Google+ and Pinterest), Fortune 100 company names are mentioned more than 10 million times per month. (Digital Buzz Blog). 17. 87 of the Fortune 100 companies are now active on at least one social network. 82 use Twitter, 75 have a Facebook page, 50 are on Google+ and 25% use Pinterest. (Digital Buzz Blog). 18. To accommodate different product lines, business units and geographies, the average Fortune 100 company now maintains 10 official corporate Twitter accounts, 10 Facebook pages and eight YouTube channels. (Digital Buzz Blog). 19. Fortune 500 companies tend to be antisocial. Less than half of Fortune 500 businesses provide a link to their Facebook profile or Twitter handle on the Contact Us page of their Web sites. About 27% of consumer-facing Fortune 500 corporations do not list social media channels on their Web site home page, 89% do not list an e-mail address on their site, and 13% don’t list a phone number on their Contact Us page. (MediaPost).